Yes, I like piña coladas, and getting caught in the rain. 1. 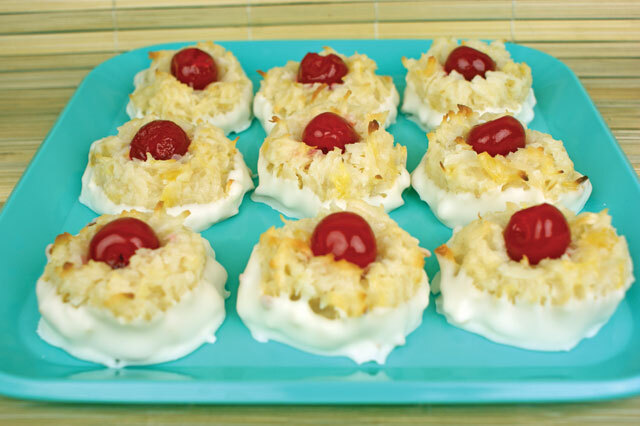 In large bowl, combine coconut, pineapple, and sweetened condensed milk; mix well. 2. Add flour; mix well. 3. Add vanilla and rum flavor; mix well. 4. Refrigerate mixture for 30 minutes. 5. Preheat oven to 350°F and scoop macaroon mixture by the tablespoonful onto a parchment paper lined baking sheet. Make a small indent on the top of each macaroon and gently press a maraschino cherry in the indentation. Bake for 15-20 minutes. 6. Remove from oven and allow to cool on wire rack. 7. Melt CANDIQUIK® Coating in Melt & Make™ Microwaveable Tray according to package directions. Dip bottom of each macaroon in coating and place on parchment paper to set.